Cold early, then sunny and mild. I got up just before 6:30am to clear skies and an hour later the sun rose to warm up slightly what was another very cold morning. I was on my way by 8:30am, still wearing a jacket for warmth, along some more beautiful sun-dappled track through a very dry eucalypt forest. No sign of the camp neighbours before I left. The trail notes said this this section was "hard" and it was definitely less-travelled than some other parts but, apart from a few short sharp climbs, the going wasn't too bad for the first few hours. I stopped at one of the rare log books on the trail for my first break and found an entry from friends Darrel, Andrew and Terry, who had run the trail in just five days, three years ago. I photographed their entry and sent it by SMS to Darrel, knowing that it would evoke some memories for him. After the break, the trail left this section of Woomargama National Park and entered some private pine plantation and grazing land. As I walked, I tuned into an interview on the ABC with Cheryl Strayed (in Sydney for the Writers Festival) about her book "Wild" describing her hike along part of the Pacific Crest Trail in the US and how it had got her life back on track after the death of her mother. I had read and enjoyed the book, which I think did a very good job of describing the miseries and joys of solo long-distance hiking. Recommended. It was also relevant because the PCT has been on my list for some time and there's a good chance I will hike the southern half (Californian section) next year. Anyway, while I listened to the radio, my trail gradually emerged from forest onto very hilly grazing land, giving sweeping views, and it became a bit harder to find the trail markers. At one point I thought I was on track, but wasn't, and had to retrace my steps and then use the map, topography and GPS to work out where the trail should be going. After travelling cross-country for about a kilometre, I left a small pocket of forest to spy, in the distance, a trail marker and after that I didn't have any more problems. That is, apart from the up and down route following fence lines across hilly open grazing lands, negotiating many stiles, and all beneath a strong sun. It was quite tiring and I began to regret my decision not to carry any water, which has been fine for most days of the hike, but not today. Finally, after a last couple of stiles the trail reached the Bowna-Wymah Road and I sat on the bottom step of the last stile and had a late lunch at 1:45pm. It was positively warm in the sun and the flies were plentiful, encouraging me not to wait for too long before beginning the last leg of the day, 7.5km along the road to The Great Aussie Holiday Park where I had booked a cabin for the night. Road-walking is hard on the feet, but a lot faster and the backroad pretty rural scenery helped the time quickly pass. I reached the very picturesque and manicured Holiday Park, on the shore of Lake Hume, at 3:30pm and checked in and bought an ice-cream and a very welcome large Diet Coke. My cabin is large and clean and after a shower and drying my tent outside in the late afternoon sun, I purchased a frozen dinner back at the camp store, and uploaded my diary entries for the last three days before cooking dinner. The battery on my laptop had lasted well, but the battery on the iPhone I use to upload to the internet on the trail had pretty much run out. I was originally planning to take two days to hike from here to the finishing point in Albury, but the thought of camping in a vehicle-accessible campsite on the outskirts of a small city on a Saturday night is not particularly inviting. Therefore I have decided to pack two days into one and make an early start tomorrow for the final 49km. I've booked a motel room in Albury near the finish point for tomorrow night and a train seat from Albury to Sydney on Sunday morning, so I'm fully committed to a big day. 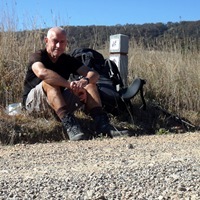 You can email Dave directly at dave@davebyrnes.com.au or subscribe to his Adventure Blogs here. You can see Dave's Running Blog here.